The UN has called for an international inquiry into the airstrike on a funeral hall which left 140 people dead in Yemen. The attack - which also injured over 500 - was one of the deadliest in the country's civil war and has been blamed on the Saudi-led coalition. 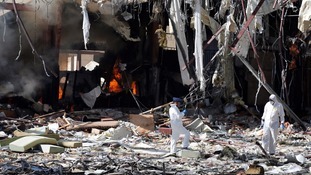 UN Human Rights chief Zeid Ra'ad al Hussein condemned the "outrageous" attack and said an independent international inquiry should be carried out into possible war crimes in the country. UN High Commissioner for Human Rights, Zeid Ra’ad Al Hussein, has reiterated calls for "an independent, international inquiry" into alleged war crimes taking place during the conflict in Yemen. His comments came as international condemnation continued over an attack on a funeral hall in Sanaa over the weekend which left more than 140 people dead. Mr Al Hussein said civilians were increasingly being targeted in Yemen by all of the sides involved in the war. Since the beginning of this conflict in Yemen, weddings, marketplaces, hospitals, schools – and now mourners at a funeral – have been hit, resulting in massive civilian casualties and zero accountability for those responsible. This deadly attack comes just weeks after the UN Human Rights Council, for the second year in a row, dismissed my call to take decisive action to create an international, independent investigative body to look into extremely serious alleged violations of international law, including possible war crimes, in Yemen. The Human Rights Council’s inability to take decisive action by setting up an international investigation is contributing to a climate of impunity, and violations continue to occur on a regular basis. Such outrageous attacks cannot be allowed to continue. Since March 2015, at least 4,125 civilians have been killed and 7,207 injured in Yemen's conflict according to the UN. Britain will not halt weapon sales to Saudi Arabia before an investigation into an airstrike which killed 140 mourners at Yemeni funeral. Planes from a Saudi Arabia-led Arab coalition patrolled the skies in Yemen during the funerals for 140 people killed in an airstrike. 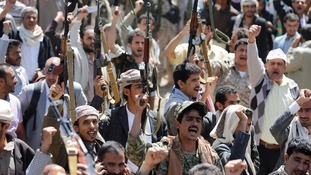 The coalition is believed to have struck a Houthi funeral gathering in Yemen's capital, Sanaa, over the weekend, injuring more than 500 people. As the funerals for the dead took place, coalition planes were said to have been seen in the sky, ITV News Correspondent Neil Connery reported. Just gone 1am and jets from Saudi-led coalition in skies above #Sanaa as explosion rings out across our part of city. Coalition jets in skies above #Sanaa graveyard as funerals of victims of weekend attack take place this morning. Foreign Secretary Boris Johnson called on Saudi Arabia to carry out an "urgent investigation" into an airstrike on funeral mourners in Yemen. An airstrike, purportedly carried out by the coalition, left at least 140 dead and over 500 injured in Yemen's capital and rebel-held Sanaa. Yemen has been in the grip of a bloody civil war for almost two years. Who is fighting whom and what over?